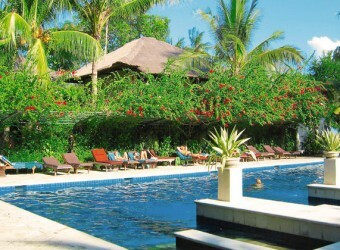 Bali Hotel Mercure Resort Sanur is an unknown good hotel in Sanur. It is located 200m from the beach, and it is favorable for Western reperaters. In the broad site of 5 ha, there are vivid color tropical flowers are blooming and the traditional Balinese rice granary shape cottages are built. The hotel has own private beach, so it is good to spend relaxing time at Sanur Beach.